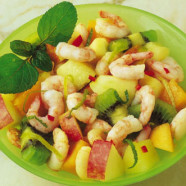 Heat the oil and cook the prawns, ginger, chilli, lime juice and rind for 2-3 minutes. Remove from the heat and add the fruit. Mix gently. Garnish with the mint and serve as a starter.